Hello friends! Long time, no blogpost. After our splendid Summer at The Well gathering on June 24, we took some time to rest and intentionally pray for guidance and direction regarding the future of The Well. I’m excited to share there’s a lot happening behind the scenes to build the spiritual and organizational foundation of this ministry. It’s a blessing to see the Holy Spirit on the move. We are now planning our second annual Advent at The Well event. Please mark your calendars for Tuesday evening, December 12, 2017. 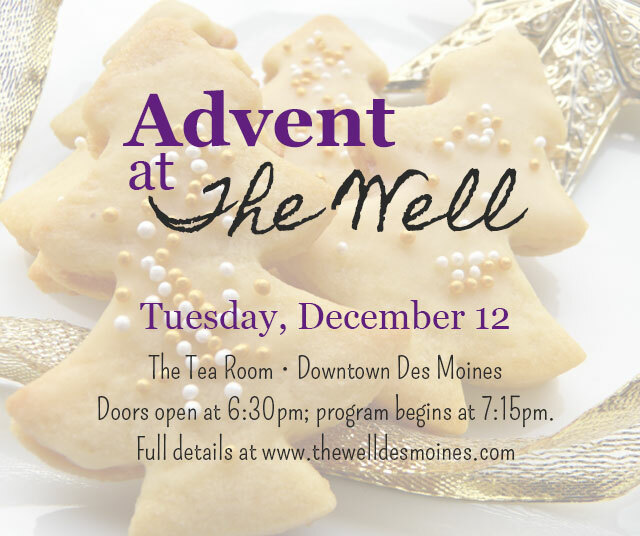 We will gather at The Tea Room in downtown Des Moines for faith, fellowship, and fun. All details including the timeframe for the evening, information about our guest speaker, and how to register for the event will be shared here at the website next Monday, November 6. In the meantime, we are looking for some helping hands to make Advent at The Well extra special. Ever hear of cookie tables? Cookie tables are a beloved wedding tradition in the Pittsburgh area, and we want to bring the tradition west to Des Moines. As the tradition goes, guests of the bride and groom, often close family members and friends, bring homemade cookies to share at the reception. As people wait for the newlyweds to make their entrance, guests enjoy cookies and conversation. A simple Google search for cookie tables will show you what a serious and lovely tradition this is! Some who’ve attended our past events have indicated an interest in sharing culinary gifts with The Well. If that’s you, here’s your opportunity! If you’d like to help on our cookie table team, please head over to our SignUpGenius here to learn more about our needs and how to add your special little touch to Advent at The Well. I’ll see you back here next Monday for all the details about 2017 Advent at the Well. Godspeed, friends. This entry was posted in Advent and tagged Advent at The Well, Blog, Cookie Table, Des Moines, The Tea Room, The Well. Bookmark the permalink.